A collection of 200 previously unpublished Easy Su Doku puzzles. Perfect for beginners curious to discover what all the fuss is about with these strangely named puzzles. Perfect also for Su Doku experts who occasionally like to dip into a lighter challenge. Guaranteed to provide hours of brain-stretching entertainment. 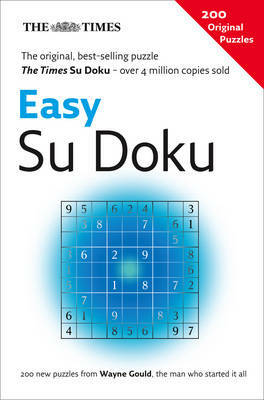 Since the first Su Doku puzzle appeared in The Times in November 2004, they have become a phenomenon, with over 4 million copies of The Times Su Doku books sold worldwide. You don't need to be a mathematical genius to solve these puzzles; it is simply a question of logic. Each puzzle has a unique solution - and there's no guesswork required. The Times Su Doku remains the original, the best and the market leader. The puzzles are provided by Wayne Gould, the man who started it all.